Double Or Nothing is sold out. All of the tickets went in a matter of minutes today and presale tickets were gone as soon as the orders could be processed. However, it looks like not all of those tickets went to fans. It seems Cody Rhodes’ plan to limit the secondary market didn’t pay off. This is why the presale code was instituted. Because there are already a load of tickets on the secondary market, but they are not cheap at all. Currently, a Double Or Nothing ticket on the floor level will cost a fan anywhere from $1,500 to $10,000. One seller priced their two tickets at $92,131 each. The cheapest seat available is now over $100 for the highest seats. 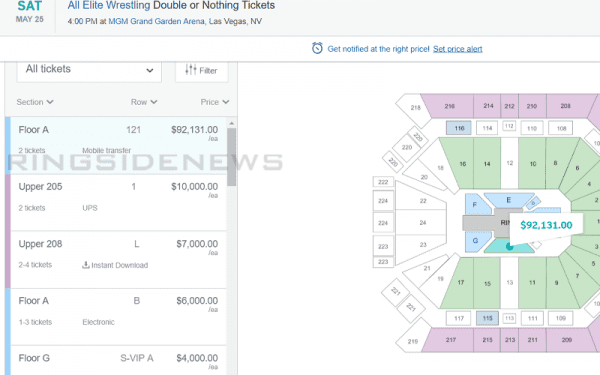 We will have to wait and see if those prices drop, but as you can see those tickets are going for huge money right now.